Demonstrating its rich British history and quality Swiss craftsmanship, Arnold & Son unveils the beautiful Eight-Day Royal Navy. The watch is a testament to Arnold & Son’s tradition of building marine chronometers. With a stunning new eight-day power reserve movement, it is part of the sophisticated Royal Collection that took its inspiration from the timepieces commissioned by King George III. Back in the 18th century, Arnold & Son’s marine chronometers delivered the robustness, reliability and down-to-the-second precision needed by marine navigators to determine longitude on the high seas. The Eight-Day Royal Navy combines these historic features with a high-performance movement and two of the hallmarks of the antic Arnold & Son chronometers: the power reserve display at 12 o’clock and the “large” small seconds at 6. Inspired by the company’s historic chronometers, the watchmakers and designers at Arnold & Son set out to create a new in-house movement featuring an eight-day power reserve together with a digital date display. 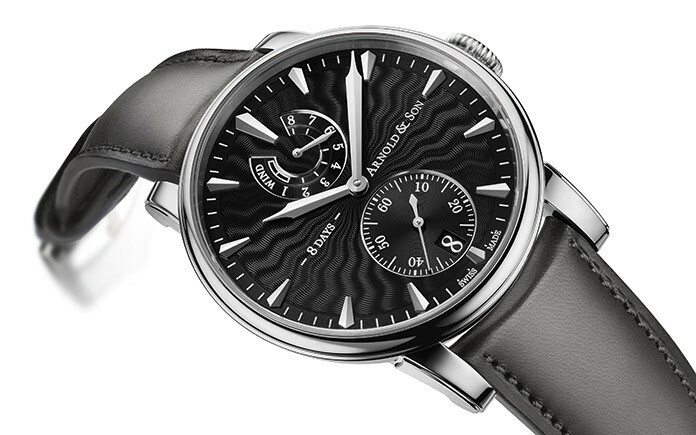 This top-flight movement features an unusually open design and meticulous finishing. It delivers further proof of the brand’s creative flair and is the 18th movement to be developed and designed in the company’s own workshops in just five years. 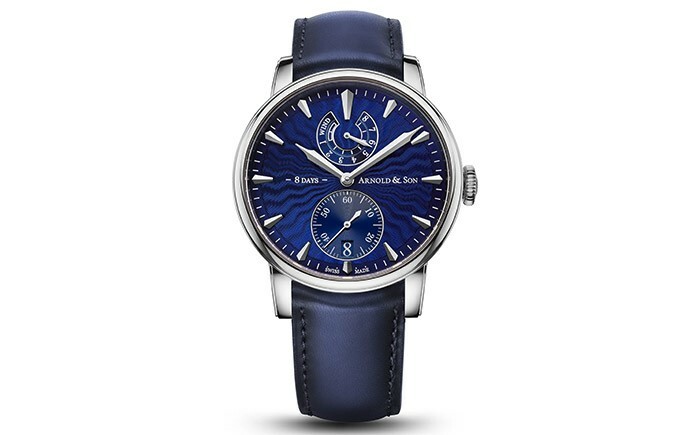 The ability to create an unending series of new, customized in-house movements enables Arnold & Son to make the perfectly designed, uncompromising timepieces for which it has made its name. Arnold & Son’s history is closely related to that of the Royal Navy. John Arnold and his son played an influential role in the directions taken by English watchmaking. They dedicated themselves exclusively to the quest for absolute precision and a solution to the problem of determining longitude accurately and reliably on the high seas. So successful were they, and of such high quality their products, that within the space of a few years they had established themselves as suppliers of choice to the Royal Navy and to some of the most distinguished mariners and explorers of their day. During this era, timepieces played a crucial role as aids to navigation and were effectively both technical and scientific instruments. John Arnold and his son decided to make them as rugged and reliable as possible, and in sufficient quantities to equip the Navy’s extensive fleet. Ultimately, they were to prove pivotal to the nation’s marine dominance and helped ensure that Britannia really did rule the waves. Given the dominance of Swiss watchmaking in modern times, it is difficult to imagine an age when another horological culture and tradition held sway in Europe. The late 18th century, however, was an age when English watchmaking reigned supreme. The country’s watchmakers developed an aesthetic entirely of their own, dictated partly by contemporary taste but also by their desire to roll back the boundaries of a field that combined art, tradition and technology like no other. To perpetuate the company’s heritage, Arnold & Son felt duty-bound to develop a new movement that would be both technically and aesthetically worthy of the House’s historic timepieces. As with every new calibre, Arnold & Son’s R&D team started with a blank sheet of paper, and set out to design a movement which, together with the case and dial, would constitute a harmonious whole. Among the more important specifications were a long power reserve, integrated power reserve and date displays, and a slim case. Ultimately, then, the positioning of every element had to be carefully though out so as to achieve the optimum arrangement for the displays on the dial. Thus was born the A&S1016 calibre. 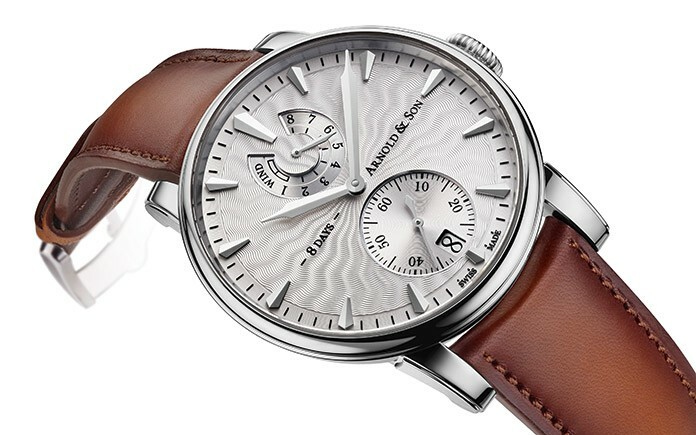 Equipped with a highly efficient twin barrel, the A&S1016 calibre features an eight-day power reserve and has a fully integrated power reserve display and date function. Despite all these features, the movement is only 4.7 mm thick. 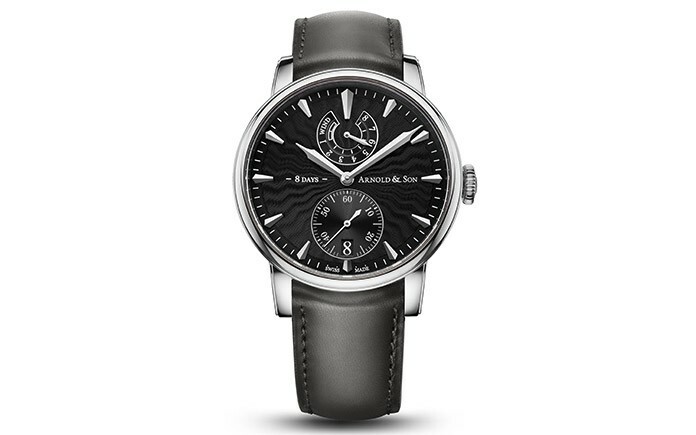 To further underscore this technical excellence and in typical Arnold & Son tradition, the 242-part, 33-jewel A&S1016 calibre is meticulously finished: the entire palladium-treated nickel-silver movement features hand finishing indicative of the finest haute horlogerie timepieces, including skeletonized and chamfered bridges with polished edges, Côtes de Genève rayonnantes and fine circular graining, circular-grained wheels, and blued screws with polished and chamfered edges. The main jewels are set in solid 18-carat gold chatons. The Eight-Day Royal Navy watch measures 43 mm in diameter, and its classically elegant stainless-steel case just 10.7 mm in height. Viewed from the side, the housing is stepped and tapers from top to bottom, the widest section accommodating the extra-large glass with the lower part narrowing to fit snugly on the wrist. As an indication of the attention to detail, the satin-finished inserts in the horns can be dismantled during servicing and re-satinized if necessary. The timepiece naturally features an anti-reflective sapphire crystal and case back to view the intricate details. The watch is available with a choice of three guilloché dials in different colours: silver grey, black anthracite or the shade of royal blue typical of the brand. 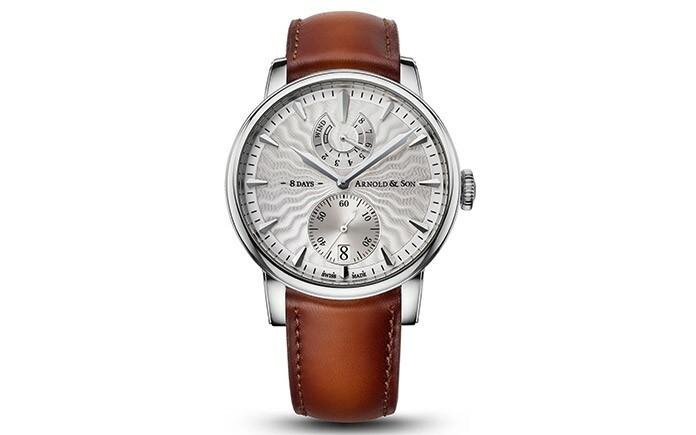 Further examples of the attention to detail are the colour of the date disc and the exquisite hand-aged calfskin strap, both of which match the colour of the dial. Overall, the Eight-Day Royal Navy is a beguiling work of technical mastery and fine art.